I’ve been working on a pretty cool wall-mounted status board as one of my projects at Fog Creek. It’s a webapp that runs on a vertically mounted LCD screen in our office. It displays a bunch of interesting information like tech support calls, staff vacations, tweets about FogBugz, and more. I’ve been incrementally adding features and improving the UI whenever I have spare cycles. 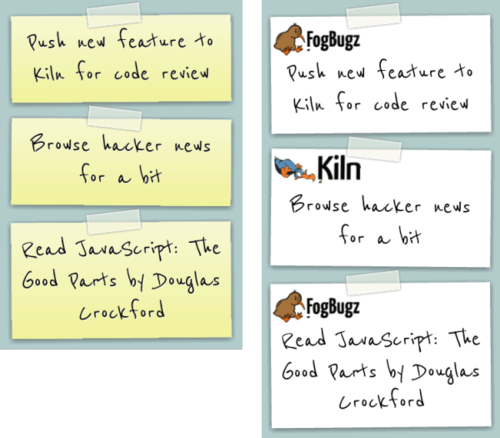 The other night, I decided to redesign the Kanban board widget, which is a list of the top N things that the customer team needs from engineering. 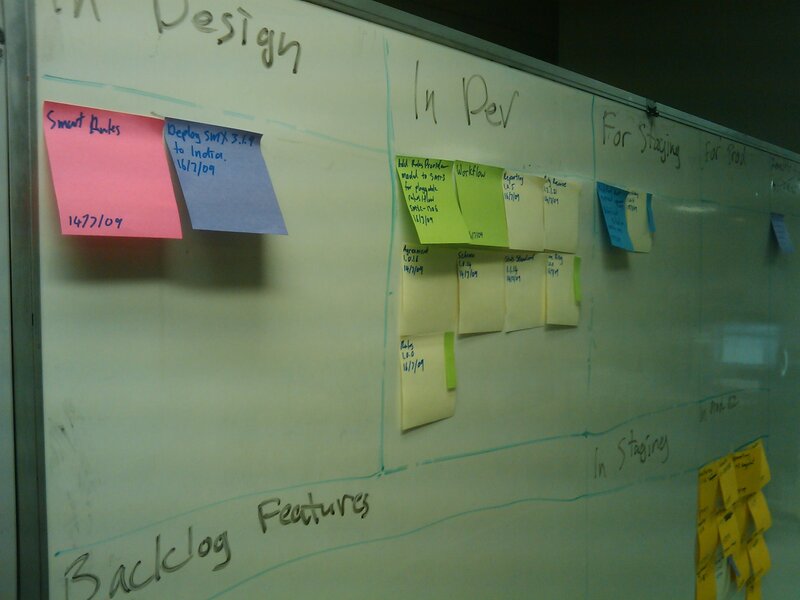 I decided to go with a sticky note UI that mimics a real-life Kanban board, which typically consists of a giant white board filled with a bunch of sticky notes. My initial design used the classic yellow sticky notes, which I thought looked pretty neat. I showed my co-worker Rich who suggested that we make the notes look like the FogBugz and Kiln notepads that are laying around the office. Awesome idea! Way better. Click here to play around with the code yourself on jsFiddle. As you can see, the implementation is pretty simple. CSS3 is really nifty. No images necessary (aside from the kiwi and dodo logos). Notice that I’m pulling in the handwriting-style font right from the Google CDN. Each note has a background gradient to give it the sticky note color. The note is rotated ever-so-slightly with a transform and decorated with a little box shadow for a 3D effect. The tape is inserted using ::before and is absolutely positioned with a box shadow, slight rotation, and a semi-transparent background color (using rgba notation to set alpha transparency). I hope you found this little technique useful. I’m going to be posting more about the big board soon. Stay tuned.